Having trouble keeping track of all your financial information, but don’t want to deal with the hassle of multiple tabs? 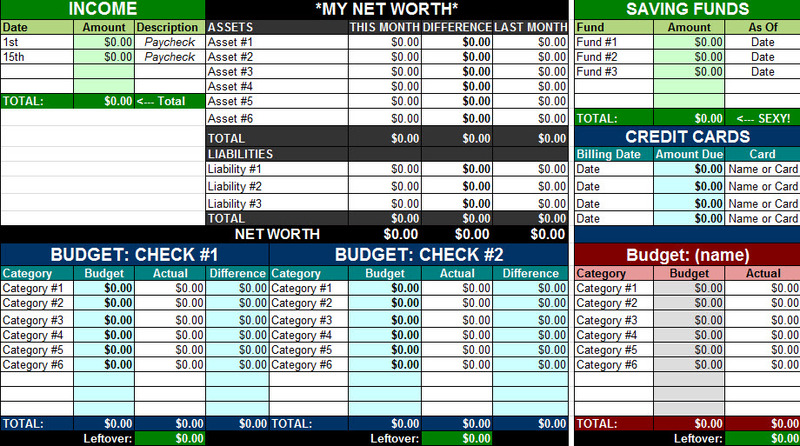 The Personal Finance Snapshot Template has everything you need to properly log, track, and edit your finances on one simple page. After downloading the Financial Snapshot and clicking on the file, you will be able to start organizing your personal information in a safe and easy environment. This template was designed so you can comfortably edit all your financial data in one free-flowing document. Nothing will escape your eye, as the conveniently color-coordinated template helps you transition from one account to the next. You can change the title of the tab at the bottom to the current month and copy the template to make a workbook for the entire year, to document your finances. Simply click on any text and start writing over the pre-written material. When you have all the information entered, click the “File” tab in the top left corner, and select the “Print” option, to have the Personal Finance Template sent to your printer. You can also choose the “Save As” option to store the budget workbook on your computer, and keep everything digital.